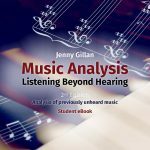 A book for analysis of previously unheard works for Year 11 and 12 teachers and students (including VCE). Aural Musicianship program for students at VCASS. From do re mi to Bach Chorales and Secondary Dominants. Working on revision and analysis papers for downloading from the website. Watch this space!